REAL ICE CREAM, MADE IN CHESHIRE, ON OUR FARM. Daresbury Dairy Ice Cream is made with love and care here at our farm in Daresbury. All our Ice Cream is made in small artisan batches using the finest ingredients and milk from our families dairy cows. Do you want a unique experience for your wedding or event? Hire our Ice Cream bicycle to give your guests something to remember. Come and visit us, we have an onsite shop open with Ice Cream available by the scoop or in take home packs. We supply a small number of local trade outlets. Our delicious farm made Ice Cream can offer something different for your customers. Daresbury Dairy Ice Cream is made with love and care here at our farm in Daresbury. Daresbury is a beautiful Cheshire Village, widely known as being the Birthplace of author Lewis Carroll and it lies in close proximity to Warrington and Halton. Our family have been farming in this idyllic setting for several generations. Our beloved Friesian Cows graze these lush pastures and give us the milk to make this delicious Ice Cream. Subscribe To Our Newsletter For Offers, News & More! Gorgeous Hot Cross Bun Flavoured Ice Cream - tastes just like the real thing! One of our favourite seasonal specials! Dairy Ice Cream scattered with inclusions of Mini Eggs & Crème Eggs! One of our most popular flavours & it's easy to see why! 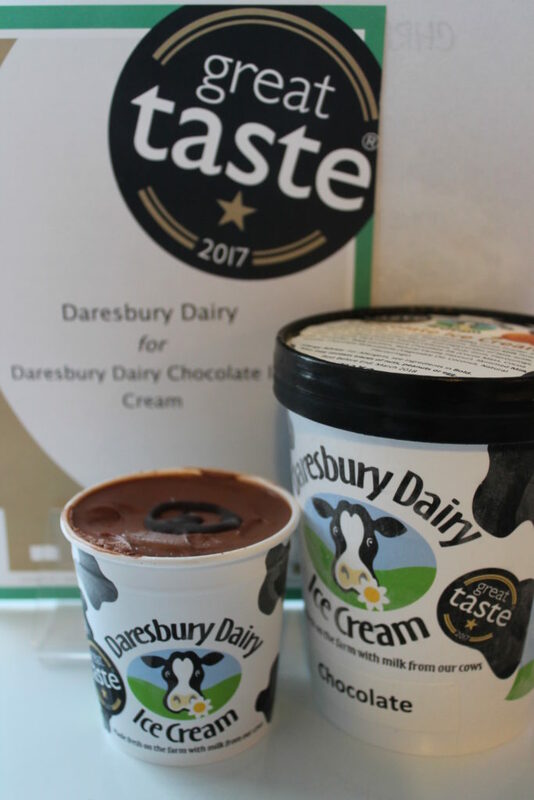 Our Chocolate Ice Cream has recently been awarded a 1-star Great Taste Award 2017, which means judges dubbed it ‘simply delicious’. Made with real Belgium Chocolate, the judges felt it was a ‘Rich, dark and delicious Ice Cream’, which was ‘fresh & creamy’. The success for this product continues to build, and in 2016 our Chocolate Ice Cream also picked up a Bronze Medal in the Chocolate Class at the Ice Cream Alliance’s National Ice Cream Competition.